In this industry we at Capability Homecare find that many people wait until a crisis to make decisions on what kind or type of care their parents will receive. More often than not, someone is in the hospital and about to be discharged and they have no where to go! If they are lucky, the discharge planner in the hospital will explain their options and hopefully a homecare agency will be able to provide service- or a skilled nursing can admit them. This isn’t always the best solution to a crisis though- decisions are made under stress and people are so desperate for a solution that they may make a decision they will later regret. Not to mention the financial mess! Trying to navigate and understand insurance plans, retirement plans, investments, IRA’s can be mind boggling! Pre planning is the key to being completely prepared should a crisis occur. 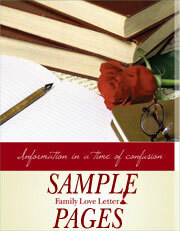 This is why I’d like to suggest the Family Love Letter. Put together by Donna Pagano, CFP and president of Family Love Letter, LLC and presented by AXA Advisors, (and given to me by a local financial planner- Leanne Plancic,) this 38 page ‘letter’ is actually a document that allows people to organize their important records/ documents and then also a place to express their wishes for when they pass away or have a catastrophic accident. Who wouldn’t want to have a say in what will happen to you? The ‘Love Letter’ complies an incredible amount of information all in one place- so that when the time comes- there will be less confusion and all important information will be accessible. It is divided into sections. It’s hard to accept that someday we, or our parents, will eventually pass on – and having the conversation about what their plans are isn’t easy. I haven’t even had it with my own parents. Let this letter be the starting point for the process of gathering information. Currently there isn’t a place in the letter to document what living arrangements you would like- but there are plenty of places to make notes- and I would suggest you spend a little time discussing what would best suit your needs. Do you want to Age in Place? Do you want to be in a nursing home? Do you want to like in an Assisted Living? Many of these (especially CCRC’s) you must plan ahead for. Be warned though- it is important to be very careful with who has access to the document. With identity theft being a serious and common problem- this document in the wrong hands could be devastating. Capability Homecare is committed to helping navigate the world of senior care and the stresses and decisions that must be made as people age. Wonderful article, and I would recommend Leanne Plancic as well. I have been fortunate enough to get a copy of the Love Letter also from Leanne. I am still filling it up but what a fantastic way to compile all of your wishes, location of things etc. I am only 34 and have had my advanced directives for 10 years now. However I often wonder if my family would know where to find everything, from life insurance policies to bank accounts. I love the fact that you can even mention what type of music you would like at your service and gives you an area to truly leave a note to your loved ones. Great job also Capability for letting families know about this great booklet.